Hi everyone. I'm here today to share with you about a new feature coming to Paper Expressions. For awhile now, I've had stirrings in my heart about doing something faith-based on my blog. Sure, I post cards with Scripture on them all the time but, I'm talking about really sharing your faith and or testimony about how this scripture has touched your life. So, I came up with the idea of Tuesday's Testimonial Linking Party. So beginning next Tuesday we will have our first Linking Party. 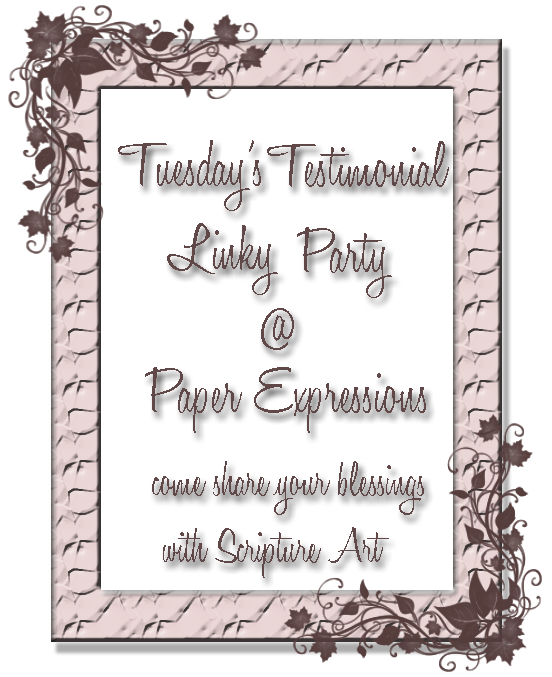 I'll start the party by sharing my piece of Scripture Art and how that Scripture has touched my life or share a testimony. There are no rules other than you need to share some Scripture Art and it would be nice if we all took the time to visit one another. I think this could just turn into one big blessing if we went around and read everyone's testimony or devotion for that day. You can link up any kind of art work you choose as long as there is a Scripture on it. It doesn't have to be newly made. It just has to come from your heart and from the Word of God. I have some Sisters in Christ out there who already provide inspiration/challenges for this type of art work. If you play along in their challenges then you could just come on over here and link up your creation. There will not be any prizes or top three's chosen. This is all to Glorify God and the Talents He has Blessed us With. 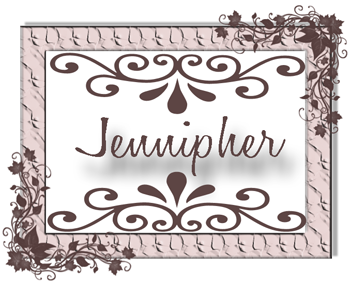 If you like this idea, please help me get the word out by posting the linking party badge to your sidebar as a picture and then include this link: http://www.jennipherlowery.com/search/label/Tuesdays%20Testimonial to get the badge to come back here when you click on it. Be sure to leave me a comment to let me know that you posted the badge. I might just have some goodies I can send out to one random person for helping me share the good news. I managed to get the button on my blog. Its the first time I have done any design editing on my blog since they changed the design format. I think I got it right. What a terrific idea, Jennipher. I simply have to find some time to participate. I think this is one I have to turn over to God and ask Him to show me where the time can be found. If nothing else for a few more weeks, I can make the rounds and visit everyone for the inspiration and blessing. :-D Hugs. 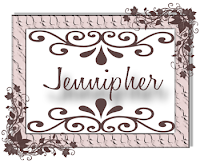 I look forward to seeing your creation Jennipher.